This isn't really a desktop shot, but rather an overview of all my current work in progress projects. A couple of Eldar Rangers I'm doing for a friend. Going for a quick paintjob here: basecoat, wash and then two layers of drybrushing. 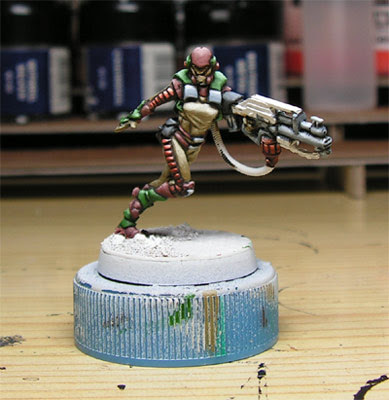 The Infinity mini which has been sitting on my desk for the last couple of months. The rifle needs to be finished and then the base. I plan to enter this figure at the painting competition at Crisis 2009, together with my Red Karnagh Drune. 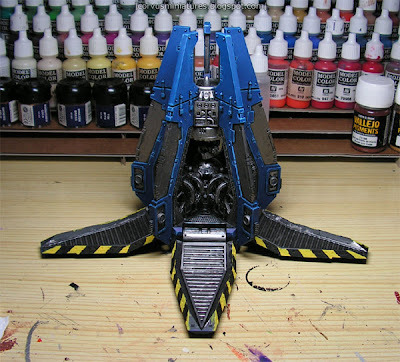 The Space Marine Drop pod: about 90% done. Stopped working on this months ago since I got seriously demotivated after painting the yellow-black striping. The yellow basically needed 4 layers to get right, and the paint also reached the other side (the outside of the door) so I needed to correct this. After correcting this I noticed blue paint on the yellow, so I had to correct this too. But the current plan is to pick this up again after the Infinity and the Mantic Elves and simply finish it. It's no more than 1 or 2 hours work I guess. 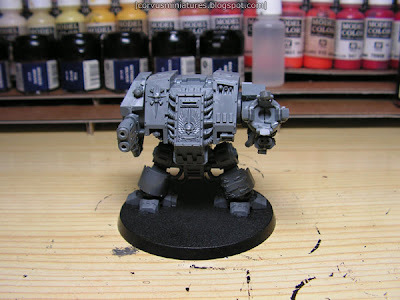 Bought this Assault on Black Reach dreadnought on eBay a while ago and already assembled it. 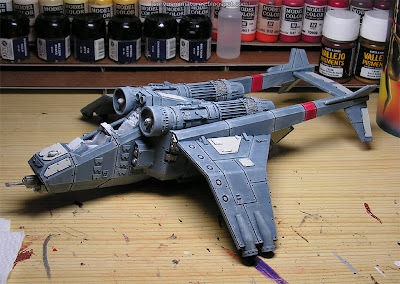 It's supposed to be the next addition to my Space Marines army so I will start working on it after the Drop Pod is done. So I really hope I can tackle all those "nearly done" project as soon as possible and focus one or two things at the same time. Well maybe three when that Valkyrie isn't done. I think one project for my Space Marine army and one small showcase or test piece is the best for me to stay focused. Of course I will keep you all updated. Those Mantic Elves look good - what base size have you mounted them onto? Like I said in one my previous posts: they're mounted on Games Workshop bases, since I didn't have the Mantic bases when I started working on this project. Look at the latest Mantic review post when you want more info about their bases and how they compare to Games Workshops. Ahh.. yes. I remember now (I jumped direct from your twitter post). 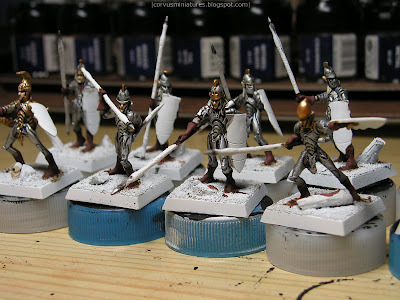 They look like 25mm GW bases as opposed to 20mm GW bases which High Elves use in WFB which is what prompted my question. The infinity mini is looking good, nice colours!